Kangaderoo Custom QR Code. : Online or offline? Quote from the movie I am number four:"Keep the photos? They're already all over the Internet!" Qr Codes are placeholders for information. The initial usage of qr codes was in the automobile industry, were parts were tracked during the production line. The content of these QR Codes would most likely not link to a site on the internet. "tel:" for a telephone number. "mailto:" for a email address. "http://" to indicate an URL. When using a prefix that requires internet access, like for mail or an URL, the amount of information that van be transferred using the QR Code is increased, everything is on the internet these day's. The tradeoff off course is that upon scanning an active internet connection is mandatory. 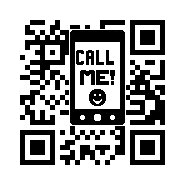 When requiring a (Custom) Qr Code ask yourself what kind of information needs to be transferred. If all the information can be placed in a single offline QR Code this might be a better alternative than a link to a internet site. See the example where the content of the code is just a phone number. This code will work even if there is no internet coverage. For your both online or offline codes that require graphical enhancement, please visit my site to see more examples of Custom QR Codes with the error correction intact for fast and reliable scanning. QR Code tags versus illegal copying.